Playpark near REI downtown. This is often the refuge for desperate boaters when nothing else is running. The water is very polluted. Confluence offers great surfing at high water, manageable whitewater for the beginner Denver kayaker, and early season training opportunities for all. 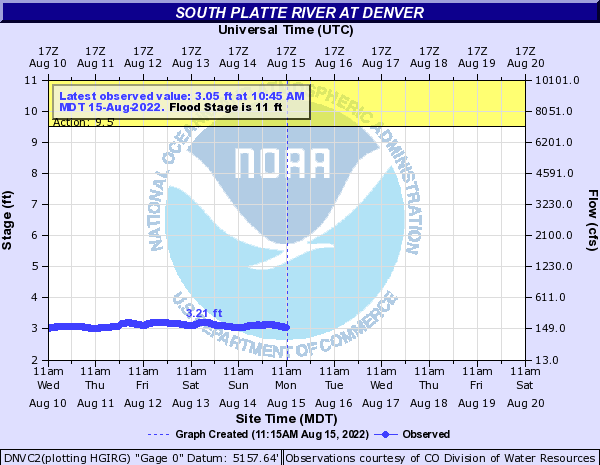 The flow for this run is calculated as the south platte CDWR gauge minus the USGS cherry creek gauge since cherry creek is added to the south platte below the confluence park but above the south platte gauge. This calculation should give a fairly accurate reading of the confluence flows.